Split pea soup is surprisingly delicious despite its name and appearance. For those that don't like it, try this recipe, it will probably change your mind. Rinse the ham hocks and set aside. Chop the carrots and set aside. 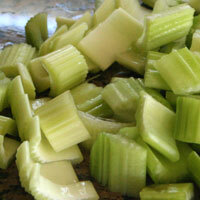 Chop the celery. Cube the potato. Set aside. 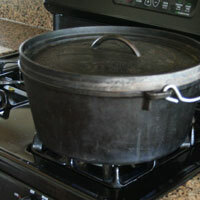 Heat olive oil in a dutch oven or large pot over medium/high heat. Add garlic, fresh ground pepper, bay leaf and onion powder. 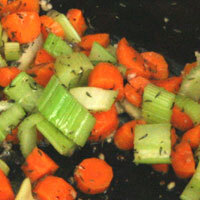 Add the celery and carrots and sautee until vegetables begin to soften, 5-10 minutes. Add the chicken broth and remaining ingredients. Cover and simmer 3 1/2 - 4 hours, stirring every hour or so. This is how the soup looks after three hours. The peas have not yet fallen apart. Don't worry, they will. At 3 1/2 - 4 hours the peas should start to fall apart when stirred. Remove the ham hocks. Cut and shred the meat. These are the meatiest ham hocks I've ever bought. Add the shredded meat to the soup. Stir well. This soup thickens a lot while it cools, so don't try boil it or add anything to thicken it. Low-Sodium Broth - Do not substitute regular chicken broth or bouillon for the low-sodium broth. You will end up with an oversalted soup. 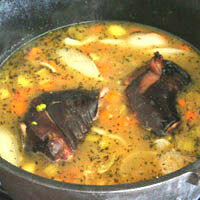 Low-sodium broth is preferrable in most recipes anyway because it is more flavorful. 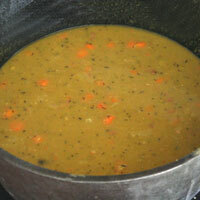 Liquid - A big problem with split pea soup is getting the amount of liquid right. It is deceptive because the peas don't fall apart until the end, so it looks very brothy. If you tried to reduce the liquid you will end up with a thick, dry mess. The amount of broth and split peas in this recipe is just right, so try not to deviate from it. Also, it will thicken as it cools. Don't try to boil any water out of it. 1. 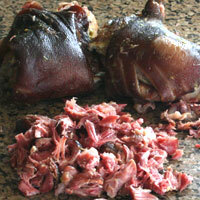 Rinse two (1)smoked ham hocks and set aside. Chop the (2)carrots, celery and potatoes and set aside. 2. Heat the olive oil in a dutch oven or large pot over medium heat. 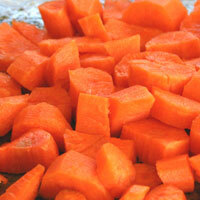 Add the celery, carrots, and potatoes and sautee until vegetables begin to soften, 5-10 minutes. Be careful not to brown them. Add garlic, fresh ground pepper, bay leaf, and (3)onion powder. 3. Add the (4)chicken broth. Add the remaining ingredients. Bring to a boil, then reduce to a low simmer. Cover and simmer 3 1/2 - 4 hours, stirring every hour or so. 4. At 3 hours the peas probably will not have not fallen apart. Don't worry, they will. At 3 1/2 - 4 hours the peas should start to fall apart when stirred. 5. Remove the (5)ham hocks. Cut and shred the meat. Add the shredded meat to the soup. Stir well. This soup thickens a lot while it cools, so don't try boil it or add anything to thicken it. Serve hot. Refrigerating - Store in an airtight container in the refrigerator up to a week. Freezing - Freeze in an airtight container or a zipper-lock bag up to 6 months. Thaw in refrigerator overnight and heat to serve. 1. 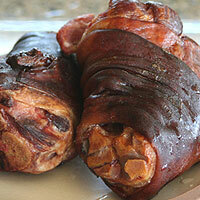 Make sure you use smoked ham hocks. The first time I made this I used a meaty ham bone thinking it would be adequate. It gave very little flavor to the soup compared to the smoked hocks. 2. 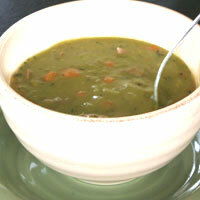 Split pea soup has a delicate balance of flavors. Once I added just one extra carrot and the carrot taste was too strong. 3. Fresh herbs are almost always better than dried, but I have tried fresh onion in this recipe and it really tastes much better with onion powder. 4. 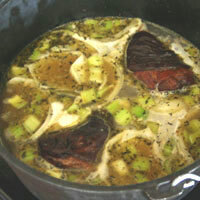 I use Swanson's broth in this recipe. Progresso's is good as well. Low-sodium is key because the ham hocks add a lot of salt. 5. The ham hocks pictured are the meatiest hocks I've ever bought. There have been times when I have gotten no meat at all off them. 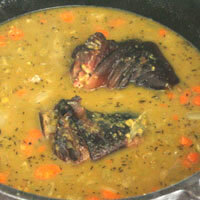 The soup from those hocks is still wonderfully flavored, there is just no meat to add back in. I don't know how to tell if a hock is meaty of not. Size and appearance don't seem to be indicators.